Help your students create the art they can only imagine. The perfect size easel for young artists! Art time has never been so fun! Help your students create the art they can only imagine. The perfect size easel for young artists! Art time has never been so fun! 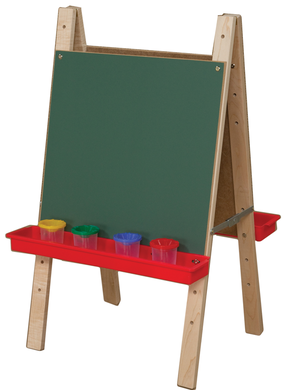 This green chalkboard with a tray on both sides supplies storage for art products. All your accessories are welcome in Wood Designs' sturdy trays! Wood Designs makes early learning furniture with the purpose of enriching the development of a young child's life. With our purpose in mind, we ensure that our materials are of the finest quality and every product is thoroughly inspected before we put it in the hands of our youngest customers.